ROCK HILL, S.C. (CNS) — How well would you do if you had to answer questions about the Catholic faith while standing in front of a room full of people? 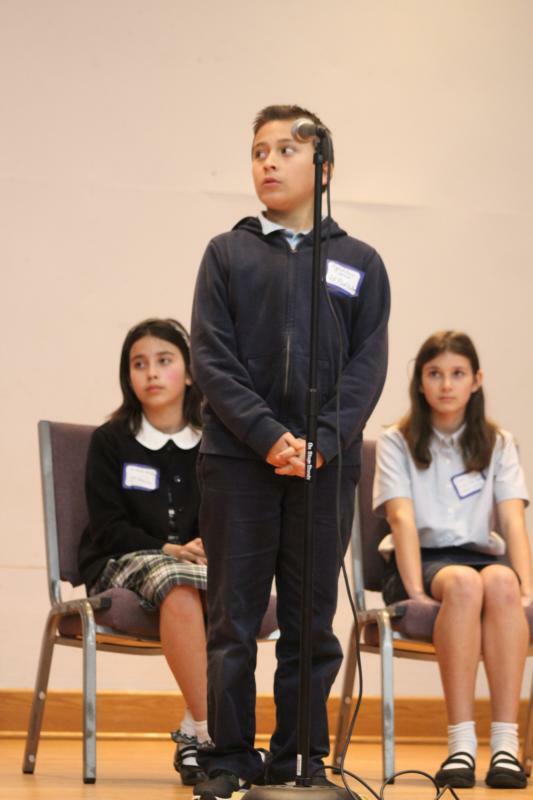 Students faced that challenge recently at the first Diocese of Charleston Catholic Bee in early March at St. Anne School in Rock Hill, which drew 30 Catholic school students in third through eighth grades from four local Catholic schools. For the past several years, St. Anne has hosted a Catholic Bee as part of its celebration of Catholic Schools Week. “This kind of event is a great way for the students to grow their Catholic identity, and it’s a way to check in and see how well they are being evangelized and catechized,” said the event’s organizer Natalie Petro, a second-grade teacher and campus minister at St. Anne. Last year she heard from principals of other schools who were interested in taking part in a statewide competition, and the idea for expanding the bee was hatched. Participants were quizzed on a wide variety of faith-related topics, from common prayers and devotions to parts of the Mass, holy days and feast days, the sacraments, saints, church history and doctrine, and basic Bible facts. Petro said organizers sent study guides to interested schools so students could prepare in advance. Some schools held their own competitions during Catholic Schools Week to select who would represent them, while others selected students to participate. The competition had two parts. Students first faced single elimination grade-level rounds. They were then asked questions that came with answer choices and had 10 to 15 seconds to respond. Winners of each grade level moved on to the title round. During the title round, they were not offered choices for the answer. In both rounds, students were eliminated if they answered incorrectly or didn’t answer within the allotted time. The final round was a particular challenge because the youth were competing based on their knowledge, not age. A third-grader had the same chance of winning as an eighth-grader. At the end of the day, the championship went to Isabella Hardesty, a fifth-grader at St. Joseph School in Anderson. In addition to bragging rights, she received a certificate and a statue of the Blessed Mother and St. Anne together. Isabella said she spent about a solid week studying the questions for the March 2 competition and memorizing as many answers as possible. St. Joseph also fielded one of the largest teams for the bee, sending 10 students. Principal Haymee Giuliani made the trip to Rock Hill with the students and their parents and chaperones. “I’m very proud of Isabella because she put in a lot of work for it,” Giuliani said. Petro said there is already interest in making the statewide Catholic Bee an annual tradition, although the exact form it will take is still in the works.